The new 6.1" iPhone XR has a ho-hum display resolution of 828 x 1792 pixels, returning 326 pixels per inch density, or just enough to be called "Liquid Retina." This is low for today's standards when even midrangers ship with 1080p Full HD screens. The flagship Huawei Mate 20, for instance, has a display with "average" FHD+ resolution which still sports much higher pixel density than the iPhone XR, on a larger screen. Apple to apples, if you will. Given that the pixel density of a mobile display is perhaps the biggest single culprit behind battery life differences, all other things being equal, that comparatively low screen resolution of the XR works to one undeniable advantage - the phone's battery life. Our own power efficiency comparison found out that the higher a phone display's resolution, the shorter the battery life when we average out their capacities. Apple is listing official battery life stats in the form of "up to" 15 hours of Internet browsing and 16 hours of video-binging, which are very respectable numbers for any handset, not just Apple phones. Not only that, but Apple is so proud of what it achieved with the iPhone XR's battery life, that it cites the "lasts up to 1.5 hours longer than iPhone 8 Plus" tidbit everywhere, as this was its previous marathon runner to aspire to. The battery in the 6.5" iPhone XS Max is of larger capacity compared to the XR, and Apple said it is the biggest ever in an iPhone. Still, the iPhone XR has better endurance stats than the XS Max with its bigger pack, and the XR's "low-res" display is the reason for what turns out to be the best ever battery life on an iPhone, according to Apple's own specs sheets. In our iPhone XR review we did put Apple's "best battery life" claims to the test and it indeed lasted the exceptional 11+ hours of screen-on time during our demanding benchmark grind. That's more than Apple's previous record-holder the 8 Plus indeed. 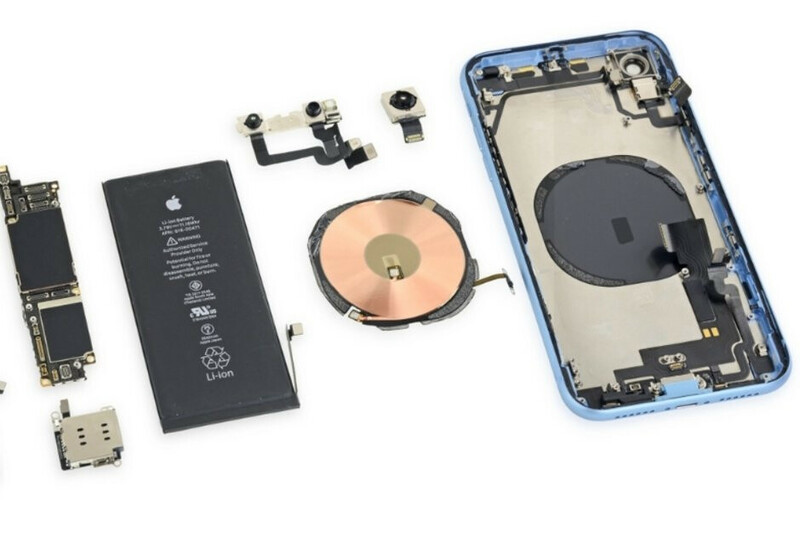 The circuit-breakers from iFixit recently disassembled the iPhone XR and found that its battery is actually thicker and with a larger capacity than the one in the 8 Plus despite that it looks marginally smaller. Since the phone's standby times are also pretty good, we found it able to endure up to two days with moderate usage which makes the iPhone XR the most impressive handset in terms of battery life Apple has ever made, and the much-maligned screen resolution is the likely culprit behind that record. Charging speeds are a whole different story, though, unless you get an extra fast charger. Not from all the YouTube channels I've been watching..
Don't really pay that much attention to youtube tests though. They are far far off from real world usage. I see people on XDA and OnePlus forums reporting 8-9 hours of Screen On Time on 6T over 2 days of usage. That is absolutely amazing. And if one decides to end it in a day, SOT is crossing 10 hours easily. From what i have seen GSMArena battery tests are the most realistic of all but yet sometimes even their results are off a bit. PA results for the iPhones (I didn't verified for this year models) are on par with GA results. "I didn't verified for this year models" For iPhone 7 and 8 the results are exactly the same (identical). The only thing that matches are the web browsing numbers. PA's tests are based on a web script according to them so it's in no way comprehensive. They seem to ignore call time and video use. They also compare the smaller, lower resolution screens of iphones to bigger fhd, fhd+ and qhd phones. Their tests are total bs that deliberately favor iphones. When you are going to transforn the results of GA in usage time, you will get the exact same results as PA did for iPhones. There's no "transformation" to be done. The GSMArena tests are more comprehensive because they include call time and video use. These are phones after all and not testing calls is like testing the AC of a car and concluding it drives well. According to Phonearena the XR has better battery life than the S9, which is simply false. By the way Leo wtf is a Liquid Retina display? It's a lowly 720p display that are standard on $130 phones. Do you guys gobble up all the faeces Apple serve you? But it is, just look closely at the battery test page. S9 battery is on par with X's - 6, 8h max (I get 5-6h with my 7 and a new battery). How should I know what a f**king liquid retina is? For all I know (and care) it is just a marketing name, like "super amoled". So you're comparing a phone with a bigger and higher quality screen of 570ppi to the 7 & 8 Plus of 401ppi? The battery on the S9 is only 100mah bigger than the 7 Plus and it's driving way more pixels. In short it's doing more and has similar battery life. Anyway the point is that PA has both iphones far outperforming the S9, which is complete bs. I am talking about (I am not making comparisons) the same battery life of 2 phones: S9 and X; I don't care how many pixels pushes one and how many pushes the other (the same way you don't seem to care how many more transistors pushes the X, that every haptic feedback in iOS uses energy, that the display on the X is brighter and more light drains more battery etc). But I will indulge you and use some math. When you use Note 9 at 1080p resolution (the resolution used to beat the Max and the resolution used in the test that you probably are talking about), you only have... 270 sppi (vs ~326 in XR) and about 5.7 mil total sub-pixels - 386x270x270/inch (vs ~4.45 mil in XR - 326x326x326/inch); considering the fact that on OLED black pixels don't draw battery while on LCD every pixel does, it's safe to say that, even when the battery times are similar, the iPhone is the better designed phone when it comes to battery life (even when all the sub-pixels of Note are lit, Apple would only need 3800 mAh). But that's just math and we don't use math, parts, mAh, sub-pixels etc we use phones, and both are great devices. PS: I have approximate in my calculations. I'll take only one point from your nonsensical drivel. Every smartphone I've owned has haptic feedback but I loathe it and switch it off. Your mentioning it as a battery drain implies that it can't be switched off in ios. Is that a correct assumption? If not then why would you mention something so irrelevant? If true then your precious ios is a bigger turd than I thought. Compare any model you wish but none outperform the S9 to the extent that PA's tests imply. Please also note that the iPhone X has an effective screen size of 5.4 inches (the notch and black bars don't count) whilst the S9 is a proper 6 incher. When any iPhone can match my NexS (or even aNote9, 6T or Mate20) in GSMArena tests I'll respect them. In the meantime just admit that there's no comparison. It is hard for anyone to explain the haptic engine in iPhones, suffice to say no other manufacturer has managed to come close to what it does (you should test it just for the fun of it); I'll ignore anything else you have said on the subject. It seems I was mistaken: GA results for iPhones are not on par with PA's. According to GA, an iPhone 7 can be used for 9h30 / day (I only managed to get 8h, with my average usage I get 5h), PA rates it at 7h40 which is manageable, given the low brightness. 6s is rated by GA at 10h - I also got ~8h (4h30-5h my average), PA rates it at 8h15. 5s is rated by GA at 9h!!! (that phone managed at best 5h, often being depleted after 3-4h), PA rates it at 5h. X: GA 11h30; PA 8h41 (I got 8h, 6h on average for me) XS Max: GA 12h30; PA 9h30 XS: GA 11h; PA 8h37 I also have looked at the GA battery times for my Android phones and one is 4h more than what I get, other is 3h30 more than the best time (6h more than what I usually get) and the other 2 I have never paid much attention; funny thing is that both get similar times with what PA's results... If you say that GA battery tests are "more comprehensive", even though - for any phone I have owned and tested - PA figures are closer to my real live results, than iPhones are even better than you made them to be. What are you talking about? GSMArena give their ratings in overall hours and only break down call time, browsing and video. So unless you're looking at just one of those categories, you're talking crap as usual. You can't compare the two accurately because PA seems to only measure web browsing because those are the only figures that are roughly in the same ballpark. Real world figures will always differ because we all use our phones differently. The tests are standardized to give an idea of what to expect. Of course Apple's haptic engine is unique, advanced, innovative and can never be replicated. Just like their low-end 720p screen on the XR is "Liquid Retina". "An overall rating of 40h means that you'll need to fully charge the device in question once every 40 hours if you do one hour of 3G [I assume now it's 4G] calls, one hour of video playback and one hour of web browsing daily. [so, a total of 3h] ... Use the sliders below to adjust the approximate usage time for each of the three battery draining components." You just have to slide the 3 components to get 24h on the custom rating column for the desired device to find out the sot (which is what PA test reveal) according to GA. Try it yourself, if you don't believe me (and share your results - for the iPhones - with us). Just try the haptic engine, before posting condescendent pieces of s**t about it. That would be true is you knew how the f*ck PA test. Virtually every other test is in line with GSMArena and not PA. Haptic Craptic....... You are the only person I've ever heard use that as an excuse for battery drain. I'm sure there are tens of millions of iPhone 7 users that manage to have 9h of sot and another tens of millions of X users that get 11h. But, if they are, why do you (and by "you" I mean Apple haters) say the iPhones have bad batteries?! Why should I find excuses, if you say that I can use my 7 for 9h every day? I'm just going to go on the evidence I've seen with my own eyes and disregard these battery tests. Virtually everyone I know who uses an iPhone is constantly looking for where to charge it. That is a fact that most people on here can attest to. Your mileage may vary but you're the exception. So now I should ignore GA results for the battery tests? That means my 7 no longer offer 9h of sot and I'm back to 5h (or 7h, if I'm careful, just like PA is saying I can)? Dude, with the Plus variant of the iPhone, with my specific usage, I never got under 8h sot/day (I have tested both 6s+ and 7+ for a few days to see if I'm ok with the size - I'm not). The era of bad battery iPhones stopped after 6. My nex s also has an incredible battery life. GSMArena result are in line with most youtube test (OP6T and Mate 20 Pro switch place sometime), but they're agree that XR and XS Max is the worst, while Note 9 is the King.. But PA test show the exact opposite, XS Max and XR is on top here, lol..
No they are not. They may be far off from your usage. So you really gonna claim. Thay no one web browses for at least an hour? Play video games foe at least an hour? Watch movies for at least an hour? And be on social media for at least an hkir? Because most tests I see is exactly what they are showing? But that's far far off? Dude? Really? Your "normalize" extrapolation is total nonsense. The size of the battery is what it is. That's like saying your car would have a range of 5,000 miles if it had a 200 gallon fuel tank. Well it doesn't and it can't. well, its just an speculation for those who are interest to know , btw the real battery life result are shown above as well. consider mate 20 pro run at not native resolution (33% lesser ) and both iphone & mate are on 7nm processor, mate 20 pro with a much larger battery(32% larger) only last 5% longer than iphone xs max. i would expect much longer battery life for mate20pro. the comparsion with the rest are not telling a clear picture as their soc are on different manufacturing process. The oracle is right, but thanks for the post anyways - never looked at it this way.